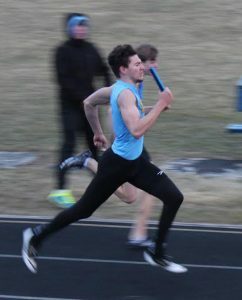 The Lynnville-Sully boys track team went on the road to Belle Plaine with hopes of getting their first win of the outdoor season last Thursday, Mar. 28. What seemed to be a really chilly night ended up not affecting the boys as they came home with their first win of the 2018 season. The Hawks were placed in the Class B division and ended up winning 11 of the scoring events, finishing the night with 184 points. The next team behind them was Montezuma with 126 points. “Brr, it was cold, but it was great for the Hawks to get out, do great things, and come home with a win for the first outdoor meet,” said head coach Mike Parkinson. Senior Corey McCoy flies down the track vying for a first-place finish in the 4x400. Field events were dominated by the Hawks as senior Drake Ehresman finished first in high jump with a leap of 5’10” with fellow senior Carson Dunsbergen finishing third with a jump of 5’6”. Freshman Carter Dunsbergen came in fifth at 4’10”, his personal best. Ehresman and junior Gage Vander Leest did well in the long jump as Ehresman finished first at 19’10.5” and Vander Leest took third with a jump of 18’1.75”. Senior Jesse Van Wyk won discus with a throw of 122’. Just behind him were junior Grant Wehrle with a personal record throw of 109’8” and junior Rylan James in third at the 106’6” mark. James also finished well in the shot put, placing first with a chuck of 46’2.5”. Wehrle and junior Evan Squires took third and fifth respectively with heaves of 39’8” and 37’5”. The shuttle hurdle, ran by Vander Leest, Carson Dunsbergen, senior Corey McCoy, and junior Tyson Vander Linden, was also won by the Hawks as they clocked a time of 1:02. Vander Linden went on to win the 400-m hurdles as well with a time of 59.59. Teammate Blake Rea, a freshman, earned fourth in the same event, finishing in 1:09.57. 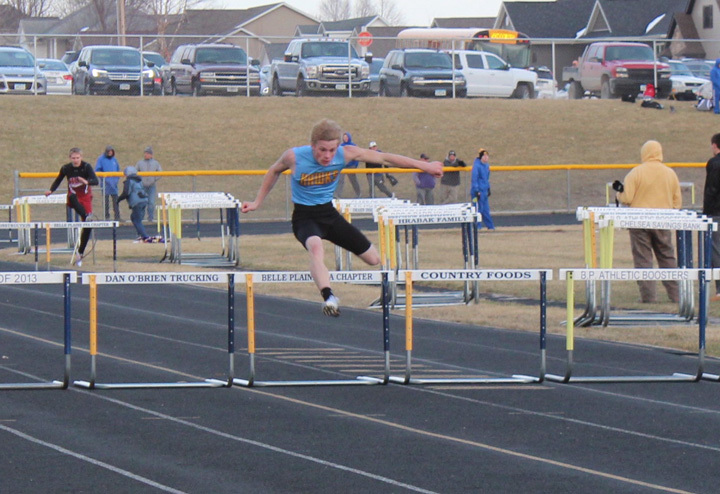 In another hurdling event, Vander Leest and Carson Dunsbergen placed first and third respectively in the 110-m hurdles in 15.94 seconds and 17.61 seconds. L-S in the open 100-m dash, placing fifth in 12.33. 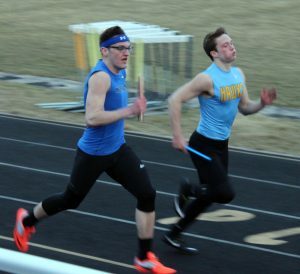 Junior Gage Vander Leest battles with a Montezuma runner as they complete their legs of the 4x400 relay. L-S won the event – the final race of the night – in a time of 3:49.75. Van Wyk combined with senior Cody Gibbs, freshman Blake Rea, and junior Hannes Van der Meer to claim the 4x800 gold medal with a time of 10:10.15. Van der Meer and Gibbs took second and third respectively in the 1600-m with times of 5:33.65 and 5:34.96. Other first-place finishes were earned by Vander Linden in the 400-m dash (53.1 seconds) and McCoy in the 800-m run (2:08.80). Junior Ty Breeden also ran the 800-m and came in fourth with a personal best time of 2:27.81. The Hawks earned second in the distance medley with a time of 4:07.40. Team members were Stock, Lukehart, Ehresman, and Van der Meer. The L-S sprint medley team of Squires, Lukehart, Stock, and Van der Meer came in fourth in 1:47.24. After a long night of running in the bitter cold, the Hawk 4x400 team, which included Vander Leest, Carson Dunsbergen, McCoy, and Zylstra, ended the night with a gold medal with a time of 3:49. Coach Parkinson was pleased to see his team compete despite the cold conditions of the meet. “We haven't had a meet like that in a long time, but the Hawks still come through in any weather!” he said. The L-S boys were set to compete in a coed meet at home on Tuesday, Apr. 3, but the meet was cancelled due to the winter weather moving through. L-S junior Tyson Vander Linden easily wins gold in the 400-m hurdles at Belle Plaine last Thursday. Next up for the Hawk track teams, the girls are set to be at Eddyville-Blakesburg this Thurs-day, Apr. 5, and the boys are scheduled for an away meet at Baxter on Friday, Apr. 6. Next week, the L-S girls and boys will be at Pella Christian on Tuesday, Apr. 10, and at Colo-NESCO on Friday, Apr. 13.